To the Victor Go the Spoils? Nope. In recent years, manufacturing has come to grips with an unavoidable fact: as production has ramped up in terms of speed and volume, so has spoilage. In fact, it has become common for companies to build in waste from scrap into its operational costs. 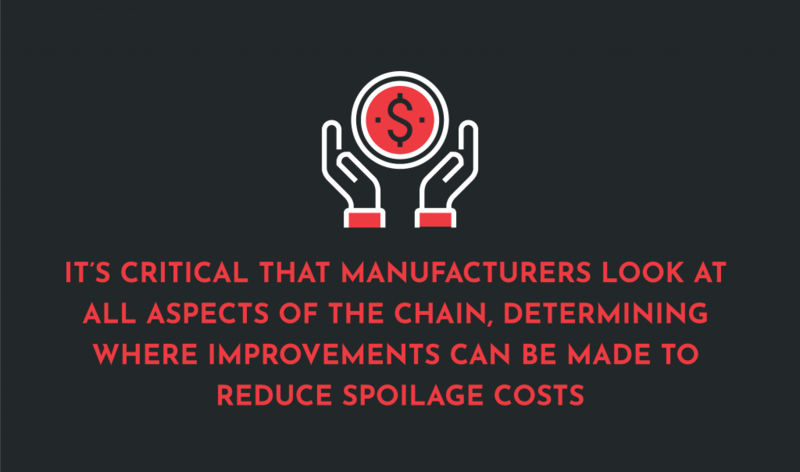 There are several ways manufacturers can reduce their spoilage costs. The first requires thorough documentation of products, their manufacturing variances and any discrepancies that may occur in their processes. By getting a better handle on the technical aspects of the product’s manufacturing, companies may be able to see where spoilage occurs. This is a vital part of any manufacturing process and having a successful organization. The second way involves mapping out manufacturing processes, outlining where human or machine error might create bottlenecks or waste thus increasing spoilage costs. One way to ensure a reduction in waste is identifying how fluid application is being handled—whether it be by assembly line workers or robotics systems. For example, if the application process is not built specifically for the material it is apply, spotty applications may result in an increase in scrap or overuse of the chemical because of improper laydown or dripping. Similarly, in automated fluid application settings using robotic systems, if flow rates are stymied by inferior tips or faulty dispensing systems that can’t maintain consistent pressure, waste will spike. Similarly, in automated fluid application settings using robotic systems, if flow rates are stymied by inferior tips or faulty dispensing systems that can’t maintain consistent pressure, waste will spike. To that end, it’s critical that manufacturers look at all aspects of the chain, determining where improvements can be made. As a premier provider of fluid application systems and solutions, Designetics knows full well the value of high-quality, precision-based manufacturing, and has put a number of processes and procedures in place to ensure its products exceed manufacturers’ expectations. These, in turn, help to reduce waste and scrap, smoothing out manufacturing processes for its clients—and making spoilage far less a concern.